The centrepiece of Labor’s plan to reduce carbon emissions – a baseline and credit scheme for the nation’s top 250 emitters – appears doomed with the Coalition opposed to the entire policy and the Greens hostile towards several elements, including letting companies offset emissions by buying international carbon permits. If Labor wins the federal election, expected to be called within days, it would need the support of either the Coalition or the Greens to secure the passage of legislation in the Senate. But in what looms as a repeat of 2009 when Kevin Rudd’s Carbon Pollution Reduction Scheme crashed, Labor has unveiled a climate change policy that is considered too soft by the Greens and too severe by the Coalition. Industry reaction to the policy ranged from hostile to cautious support. The Australian Industry Group and the Business Council of Australia, who between them represent many of the affected businesses, said everything would hinge on the details to be negotiated after the election. These include the exemptions for trade-exposed industries such a steel, cement and aluminium, as well as the pollution caps and the trajectory by which they will be reduced. To meet its ambition of reducing economy-wide emissions by 45 per cent on 2005 levels by 2030, Labor unveiled a policy which introduces a baseline and credit scheme for heavy emitters and an electric vehicle target and emissions standards for the transport sector. The energy sector is exempt from the baseline and credits scheme. Its emissions will be reduced by a a 50 per cent renewable energy target, subsidising household batteries, underwriting clean energy generation and, if the Coalition agrees, bringing back the National Energy Guarantee. Agriculture is also exempt and will contribute to emissions reduction through an increase in carbon farming and restrictions on land clearing. The baseline and credit scheme is a ratcheting up of a current scheme that was put in place under Tony Abbott but was generous to the point no one was ever affected. Labor will reduce the threshold from 100,000 tonnes of carbon dioxide emitted each year to 25,000 tonnes. Any company which emits above 25,000 tonnes, of which there are about 250, will be covered by the scheme which will require them to reduce emissions towards 2030 to help meet the 45 per cent target. Those who exceed the cap can use offsets including buying international permits or agricultural offsets. Companies which beat their caps can carry over the credit or trade it to another company which needs offsets. Despite there being no details of the cap or the trajectory, Prime Minister Scott Morrison dusted off the carbon tax scare campaign and claimed the impost on the affected businesses would be $35 billion. In doing so, he mocked the use of international permits. “It’s a massive tax on jobs. It’s $35 billion that Australian companies are going to have to spend, sending money offshore to foreign carbon traders. Carbon credits for Kazakhstan, that’s what this is for,” he said. Greens climate change spokesman Adam Bandt also opposes international credits but for different reasons. “International offsets delay climate action in Australia. More coal will be burnt at home and the transition to 100 per cent renewables will be delayed,” he said. He said the Greens also opposed the baseline and credit scheme and, if Labor won the election, would push for major changes in the Senate. “By adopting the ineffective safeguard mechanism with huge carve-outs for some sectors, it looks like the free ride for big business in this country on climate will continue under Bill Shorten,” he said. 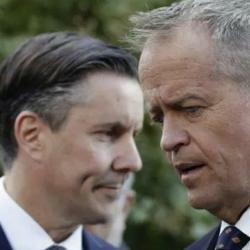 Unlike the Coalition, Labor will not contribute to its emissions reduction target by factoring in the carry-over from Australia supposedly exceeding its Kyoto target of cutting emissions by 5 per cent on 2005 levels by 2020. The government claims the Kyoto target will be exceeded and it will use the credits towards its 26-28 per cent targets. Labor says this is “a dodgy accounting trick”. Labor Leader Bill Shorten said the government failed to heed the message about climate change. “It’s about hope versus fear. It’s about handing on a better deal to our kids. It’s about not putting off the problems of carbon pollution to another generation merely because of disunity and dysfunction in the current government,” he said. The Minerals Council of Australia demanded the use of Kyoto carry-over while AiGroup chief executive Innes Willox was lukewarm towards the baseline and credit scheme. He supported access to cheap overseas permits, protecting trade-exposed industries and called for flexibility in the emissions reduction trajectory. The BCA also called for the use of the Kyoto carry-over and demanded both parties recommit to the NEG. Labor’s target to have electric cars constitute 50 per cent of new car sales by 2030 was also mocked by Mr Morrison. “Labor are talking about taking it in 10 years from 0.2 per cent of the market to 50 per cent. Now, he needs to explain how he’s going to make that happen,” the Prime Minister said.